Where do you carry your stress and tension? The fact is that over 80% of the population experiences upper back or neck pain at some point in their lives. Under stress, the neck and upper back unconsciously contract, creating pain and discomfort. Living in an age of repetitive motion and inactivity causes tension to accumulate in this area. Qi Gong teaches basic stretches and exercises to compensate for repetitive movement, muscular tension, and injury to this area. Qi Gong, for thousands of years has helped people alleviate stress, clear tension, and calm the mind. Through gentle stretching, deep breathing, relaxing pressure point therapy, and flowing movements, Qi Gong clears lines of tension and those areas where we chronically hold stress. Instead of taking a pain killer, try Qi Gong! Get to the source of the problem and release tightness and pain naturally. Learn the skills and resources to take care of your body from the inside out. It’s our hope that through Qi Gong, you experience a tension free body, a relaxed pain free upper back and neck, and a calm clear mind. As it was said in the classics, “Flowing water doesn’t stagnate,” and the same is true for your body. 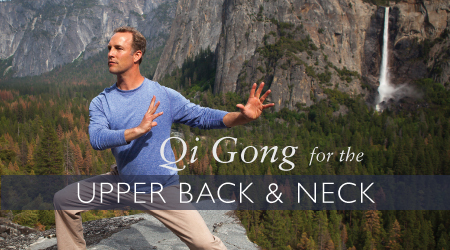 Join Qi Gong teacher and Public Television favorite, Lee Holden, in a simple and easy to follow routine and experience a tension-free upper back and neck.